The final presentation of Nadiatools took place on March 28th. 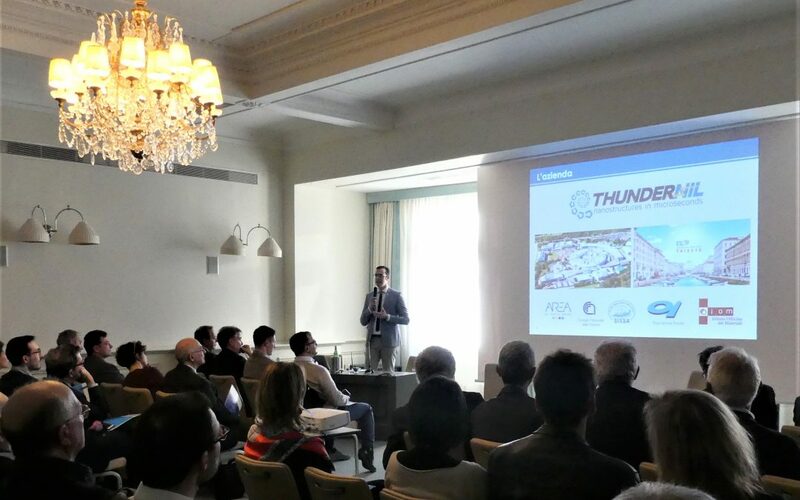 The event, which took place at the Starhotels Savoia Excelsior Palace in Trieste, was attended by all the companies, research bodies and public bodies that collaborated in the realization of the project, each presenting the work done within this research. On behalf of ThunderNIL, Ing. Michele Pianigiani and Dr. Erica Bastiani illustrated respectively the technical realization of the nanoelectrode and its functionalization to make it an immunosensor of high sensitivity and reliability. The event highlighted the peculiarity of the Friuli-Venezia Giulia region to combine public and private realities in a multidisciplinary context, with experts in biology, nanotechnology, robotics and information technology, with the aim of improving the life of its citizens and at the same time developing business opportunities within the territory. The Nadiatools project was in fact funded through regional contributions Por-Fesr 2014-2020 aimed precisely at encouraging strategic research and development projects to be implemented through public-private partnerships in multiple areas of specialization.